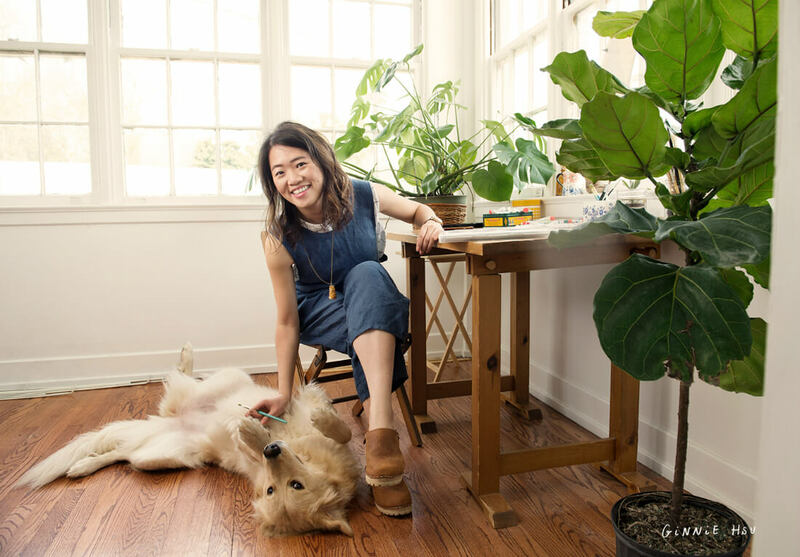 Illustrator Ginnie Hsu with her dog-muse, Luna. 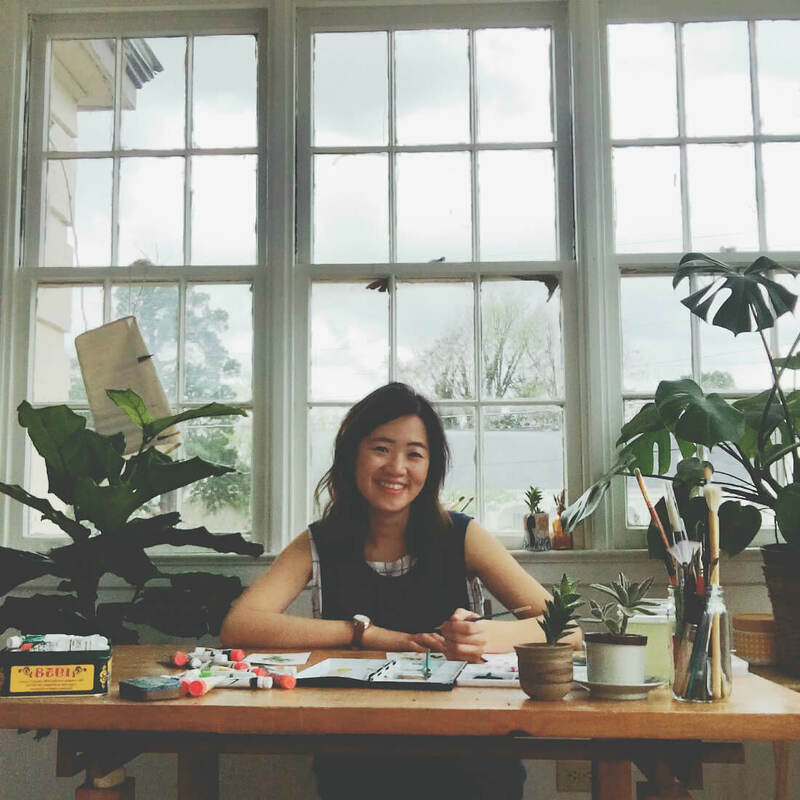 Last month, I featured amazingly talented illustrator Ginnie Hsu. Today we're lucky to have Ginnie back on the blog answering some questions for Jackie O My! In her interview, Ginnie talks art, inspiration, and Harry Potter. Read on below! Tell me a bit about yourself. Where are you from? I am originally from Taiwan, a little tiny sweet island in Asia and moved to Texas for college. Now, I live in Mississippi by a wildlife refuge where I teach, illustrate and design. I love people, yoga, the farmer's market, cooking, making things, and travel. Oh, and I love my dog very much! Her name is Luna! Nature, outdoors, museums, plants and people. I try to go outside when I have time to walk around and forage. It makes me very happy to be outside. Are there any artists you're a fan of? Yes, a lot, actually. If you are talking about illustrators, I am a fan of Grandma Moses, Jacqueline Duheme, Christoph Niemann, Oliver Jeffers, and Carson Ellis. As for other timeless artists, I like Caravaggio's story telling, Matisse's color use, and Rene Magritte's concepts. I always feel like art and stories go hand-in-hand. Do you have a favorite book? Yes. All-time favorite - Harry Potter, of course. Who's favorite book is not that series? And The Big Magic by Elizabeth Gilbert. Highly recommended if you are scared of pursuing your dream like I did. I can re-read them over and over again, haha! I do also read other books. I just finished reading a book called Rain: A Natural and Cultural History by Cynthia Barnett. I've learned a lot about rain as the author did a great job researching! Totally recommended. How long have you been making art? How did you find your illustration style? I've been drawing since I was 5 and have been making things. I don't consider myself having an illustration style, but my friends say I have one, lol... So, I guess I do. I just keep drawing and trying out things I like to use and I don't like. Do you have a favorite thing/art piece you've created? What are you most proud of? Yes! I love this tiny little wall hanging I made last year. I used flowers I picked outside and weaved them in. I've noticed that in a few of your pieces you can spot the same little blonde dog. Is she inspired by anyone you know? This is the first interview I've ever conducted, and I think it's gone swimmingly. 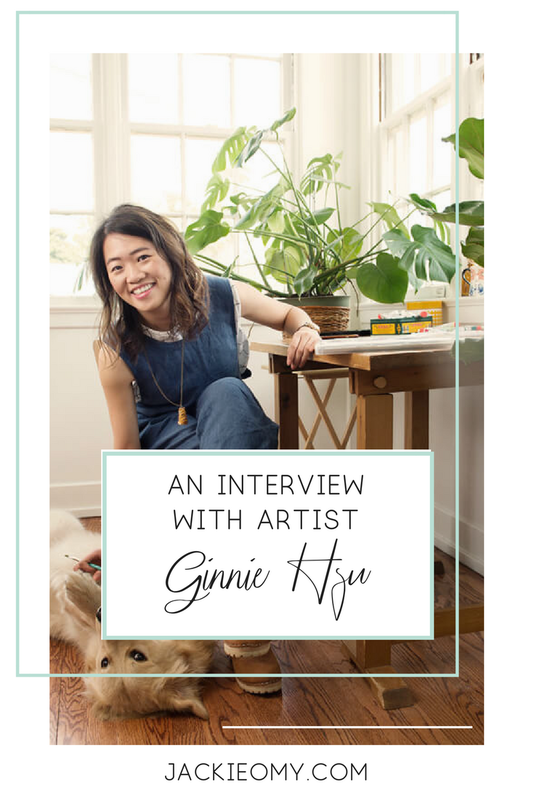 Ginnie Hsu is such a pleasure to correspond with and I would like to thank her so much for being interviewed on this blog! I would also like to thank photographer Megan Bean for the lovely photos. For more of Ginnie's amazing artwork, pop over to see her on Instagram.